Effective July 30, 2018, Mika Nash, Ed.D. will join American International College (AIC) as the executive vice president for academic affairs. Dr. Nash comes to AIC from Champlain College in Vermont where she served as the dean of Continuing Professional Studies. Mika Nash, Ed.D., joins American International College in Springfield, MA as Executive Vice President for Academic Affairs. 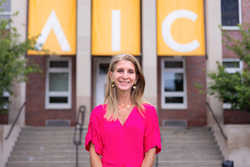 "I was drawn to AIC because its mission is one that resonates for me – initially built as an institution focused on providing educational opportunities to immigrants and then expanding the vision to a diverse student body – grounding that academic journey in liberal arts and a career-focused major." Dr. Nash has more than 20 years of experience in the field of higher education with the majority of her career spent in senior leadership. In her most recent role, Nash was tasked with the development and administration of all academic and operational responsibilities associated with running the Continuing Professional Studies academic unit with management oversight for all curricula, academic programs, academic policies, articulation agreements, eLearning, faculty recruiting, training and development, and building student, family, and academic support services. A particular area of interest and scholarship for Nash continues to be technology innovation to expand the student experience and engagement in course content. During her tenure with Champlain College, Nash oversaw enrollment growth from 900 active students to its current enrollment of 3,500 and doubled the portfolio of academic offerings from 30 to 65 programs. The division of Continuing Professional Studies at Champlain College serves undergraduate and graduate students in degree and certificate programs in business, accounting, information technology, and healthcare administration. In addition to expanding academic programs and increasing enrollment while at the college, Nash sat on the provost council and was a voting member of the Curriculum Committee and Faculty Senate. Further, she served as a long-standing member of the President’s Diversity Council for the institution, was a founding member of the Diversity and Inclusion Advocacy Committee, and was a graduate of and co-teacher for Intercultural University. Prior to joining Champlain College in 2007, Dr. Nash served as the dean for the School of Hospitality and Restaurant Management at the New England Culinary Institute. Nash received her undergraduate and graduate degrees at the University of Vermont. Her doctorate is in higher educational leadership and policy studies. More information about AIC and its undergraduate and graduate program offerings can be found online at aic.edu. Founded in 1885, American International College (AIC) is a private, co-educational, doctoral granting institution located in Springfield, Massachusetts comprising the School of Business, Arts & Sciences, the School of Education, and the School of Health Sciences. AIC supports and advances education, diversity, and opportunity for its students and the community.